Some progress has been made on the Bouillabaisse quilt top – just remember the turtle won the race. Saturday I calculated how many side triangles I needed, figured out how many strips sets needed to be sewn (7) and cut the fabric. Sunday morning it was pedal to the medal moving those long strips through the sewing machine and now all strip sets are completed. Once that was done it was a fairly quick process to complete 3 more blocks bringing the total up to 6. Yeah! Halfway there. Bouillabaisse has actually turned into a two-design wall project. The 6 blocks are on the largest design wall and all the parts are on another. Hopefully the center of this quilt will be all together by next weekend. I also pulled out an older quilt top for machine quilting. 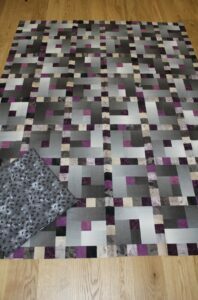 The pattern name is Ruby in the Sky (62″ x 82″) and it was made from a kit in 2011. 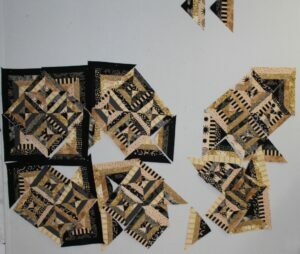 The fabric on the lower left is for the backing. It is hard to see in the picture, but those are flying birds on a gray background. I used all the leftover fabric from Ruby in the Sky to make this hexagon quilt. Lots of great projects today. 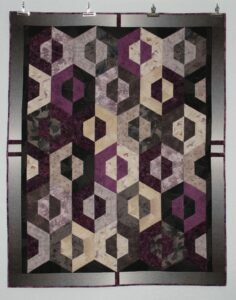 Love the colors in your “leftovers” quilt. Who is the designer of the bouillabaisse pattern? And is it still available? 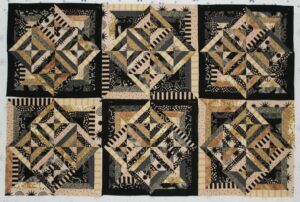 I love your color choices, to me it makes the quilt. The Bouillabaisse pattern is from Pie in the Sky Quilts. I just did a quick Google search and it appears that the pattern is still available for purchase. The black and tan is really dramatic. I probably wouldn’t have bought the pattern if I hadn’t seen a sample with these colors.